Two Guy Aitchison Seminars You Can Catch In October! It's been almost a year since the last time I've given a seminar, which was at the WorldWide Tattoo Conference in Portland, Oregon, which gave me the opportunity to go into the subject of coverup tattooing, from a fresh updated perspective. 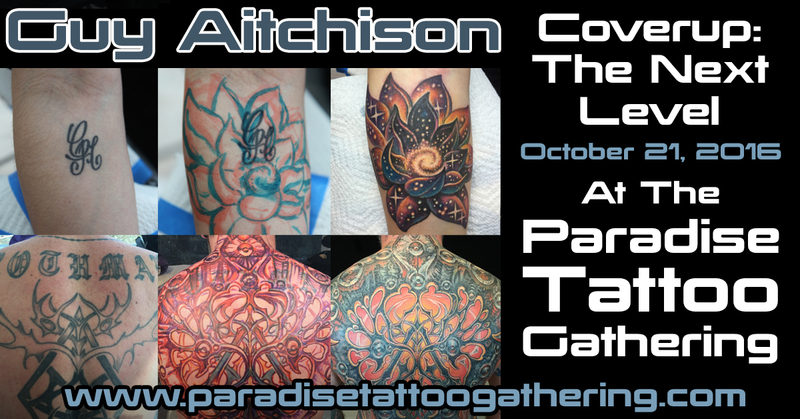 This coming October, I'll be teaching two different classes at the Paradise Tattoo Gathering at Jiminy Peak, Massachusetts. The first one, Coverup: The Next Level is a followup on the coverup theme, since I believe it is one of the most important skills that a tattooist can have. This time through I'll be teaching in a smaller classroom, and I'll be asking participants to bring me photos of their own coverup challenges, for us to discuss on the big screen, so that everyone attending will have some take-home things that they can immediately put into practice. In the second class, Flow & Fit: A Hands- On Workshop, I'll be going into some of the core design theory from the Reinventing The Tattoo curriculum. The way that a tattoo design sits on the human form is at the very foundation of how to make an attractive tattoo. In this class we'll learn about the most important muscle groups, and the unique design opportunities found in every body type. There will be a series of short drawing exercises which we will review together in the classroom, giving everyone a chance to put some of the theory into practice so they'll have some new design tools to take back to the studio and put into everyday use. As a special exclusively for Paradise Tattoo Gathering guests, we are offering a $100.00 discount off a one year subscription to Reinventing The Tattoo for anyone who purchases tickets to both seminars. For attending artists who are already Reinventing subscribers, you can apply that credit to a gift subscription for your apprentice or coworker, or towards renewing your own subscription when the time arrives. Either way, we'd like to invite you to attend these two courses at the beautiful alpine resort setting that Jiminy Peak has to offer. We also carry the tickets to the Paradise Tattoo Gathering event, which are required for all seminar guests, and give you access to the convention floor and other amenities.